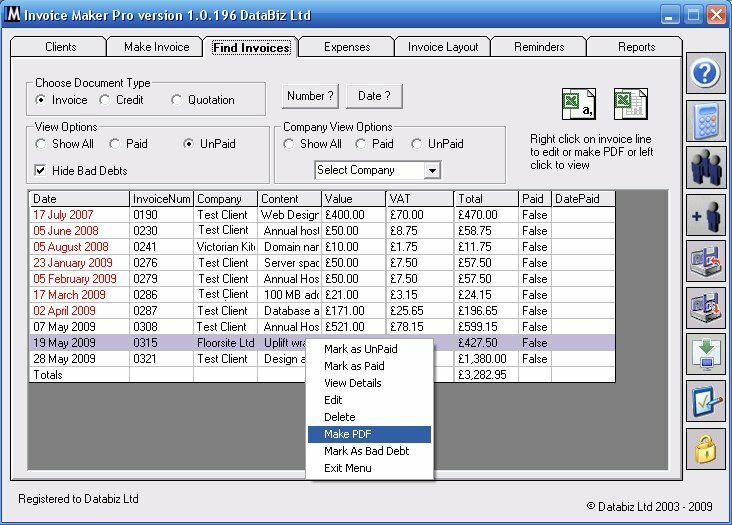 A recently added extra function is the ability for Invoice Maker Pro to generate invoices as PDFs. Just right click on the invoice you wish to make into a PDF and select "Make PDF" from the pop up mini menu. Invoice Maker Pro now comes with the ability to make invoices as PDFs making it easier to send invoices by email. To create an invoice as PDF click the "Find Invoices" tab and right click on the invoice you wish to create as PDF. From the mini menu that pops up select "Make PDF" and your invoice will be created as a PDF and saved in the local folder usually "C:\Program files\ImPro\PDFs"
Making invoices as PDFs is more secure than other file types that could be edited by others. It is also more environmentally friendly and cost efficient saving printer ink, paper and postage. This is a major step forward for InvoiceMakerPro however there are a few limitations but we felt that the ability to make PDFs out weighed this consideration. Graphic Logos format is limited to .jpg only. Your address is best displayed as a block not as a line. If you set the address as a line it may not display correctly.